Beat the heat with cool & refreshing drink "Homemade Coffee Smoothie". This creamy coffee smoothie makes your day perfect. Instant coffee smoothie made with milk, coffee powder and other ingredients. This is instant breakfast meal also. This is my first experience to made this chilled tasty coffee smoothie and it was awesome & delicious too. This is not an ordinary cold coffee shake, I made this chilled smoothie with my own fusion. I added interesting ingredients in this coffee smoothie. I hope you'll all like my fusion. Let's check out this special ingredients below in the recipe. Vanilla essence - 1 tbsp. Chocolate Sauce : Melt little bit chocolate in a microwave or double boiler for garnishing. 1. For preparing tasty coffee smoothie, first blend coffee powder, sugar and water. 2. Next add milk, vanilla essence, dark chocolate. 3. Add ice cubes and mix well. 4. Take glasses, use that chocolate sauce in glasses and keep it into the fridge before serving. 5. 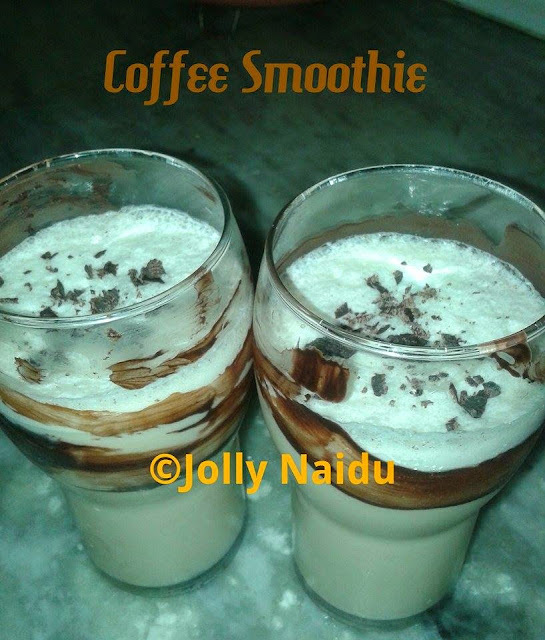 Now Pour the chilled coffee smoothie in glasses and use grated chocolates for garnishing.